I was with my Misys good friends Louie, Ryan, Arleen, Emman and Harold on the night of April 3. After my workout in Fitness First RSC Makati, I met them in our meeting place in Jollibee. Arleen was so damn late that time so we left the place before 9 in the evening. It was a boys night out again but this time, we just planned on having a dinner in a "dampa" style at the back of Mall of Asia. I was happy seeing them again eventhough it was only three months since the last time I saw them and another thing, namiss ko kumain sa MOA. We headed first to the wet market and bought shrimp, tilapia, tuna belly, squid and a big head of a fish (sorry di ko alam name ng fish :>) and the total bill for the "pamamalengke" was 1,250php. Our "palutuan" place that time was in "Kainan sa Balanghay". We were able to get free two pitchers of iced tea. The foods were overflowing, we had buttered shripm, tempura, pinaputok na tilapia, inihaw na tuna, calamares and sinigang sa miso. It was a no diet mode that time so I just ate without thinking the percentage of calories, fats, etc. 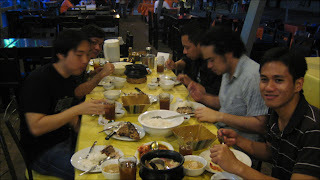 The total bill for the "paluto" was 1,350php so in total, we spent 2,600php for the dinner and it wasn't that bad. The foods were really good and delicious except for the calamares. After that, an idea of going to Louie's house just popped out. Hahaha, at first, he was very hesitant to bring us in their home but eventually he agreed (napilit din... hahaha). The original plan was to watch the Wolverine movie courtesy of Arleen. Unfortunately, we weren't able to watch it as Louie's player wasn't able to fully read the USB. We also tried to look for a blank DVD so that we can just burn the AVI copy but there was no available disc at that time. So we just stayed there for a while and I tried to watch the first part of the movie while the others were watching basketball. I toured myself in Louie's pad it was really nice! After a while, pinapalayas na kami ni singkit... hahaha... So we parted ways at around 12:30 in the morning and it was another memorable night for all of us.